Creating content which educates and informs your audience about the challenges they face will resonate much better and lead to more engagement and conversion. Remember to use the right mix of words, images and video to get your message across! You have a great story to tell and want to let the world know all about it, but how will you do it? Creating high quality and insightful content on a regular basis is one of the best ways to get your message across to your target audience. At Enlighten IC use numerous types of content to tell our clients story. We don't believe in a one size fits all mentality and will approach your unique set of circumstances with fresh eyes. We will get to know you and your audience and use this insight to develop a relevant content plan to get your message across. Make sure your content addresses the pains and challenges your audience faces. Get your message across quickly, clearly and ensure it has a purpose. Develop content to get your audience to engage and make contact with you. Remember that isn’t just about YOUR MESSAGE telling people how wonderful you are - it's about giving to get and helping your audience along THEIR journey. What makes your audience tick? Before any content is created work out who your audience is. What pains and challenges do they regularly suffer which your organisation could help to resolve? Building detailed Personas for each of your core audiences will allow more compelling and engaging content to be created which will resonate much better with them and lead to better conversion rates. Not all website visitors are equal and may be at different points on their journey. We call this the Buyers’ Journey with some visitors having just started out and not really understanding the extent of the issue. Others may have moved on and are now out looking for a solution. 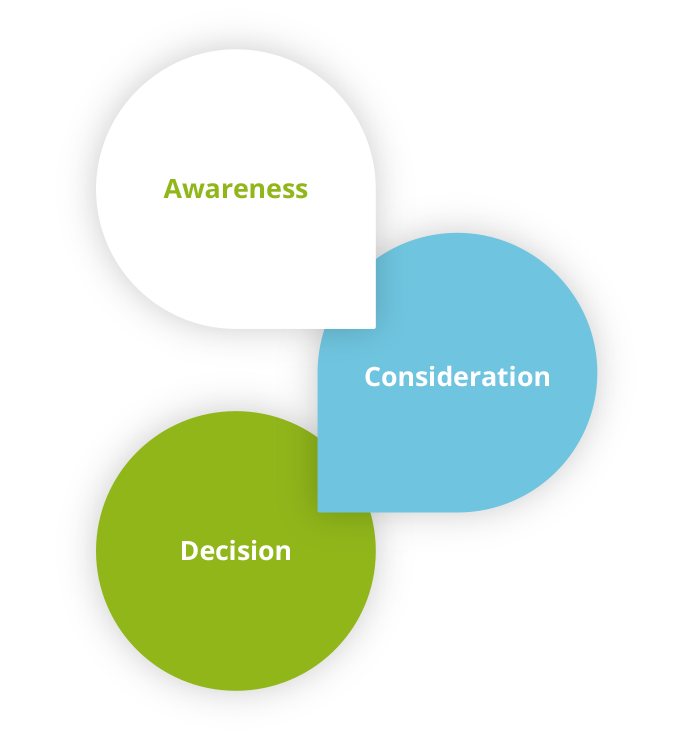 The last step in the Buyers’ Journey is the decision stage when the prospect is about to make a decision and are therefore looking for information to help them with this decision making process. Depending on where your prospect sits on the Buyers' Journey will determine the type of information they want to consume. Make sure you have a selection of content which addresses each of the stages in the Buyers’ Journey. If you would like to discuss how we create content which resonates, please get in touch for an initial consultation to discuss your content marketing needs.